Google is king when it comes to search engines, taking up 75% of the US market and totaling 40,000 searches per second. With millions of people turning to Google to make their purchasing decisions, small business owners need to understand how Google Search works in order to get their website listed on the results page. 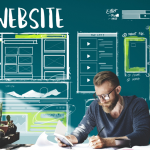 Before we get started, check out our guide on how to get a website up and running. It's surprisingly easy to get a Wordpress site set up on a custom domain. Click here to give it a shot. 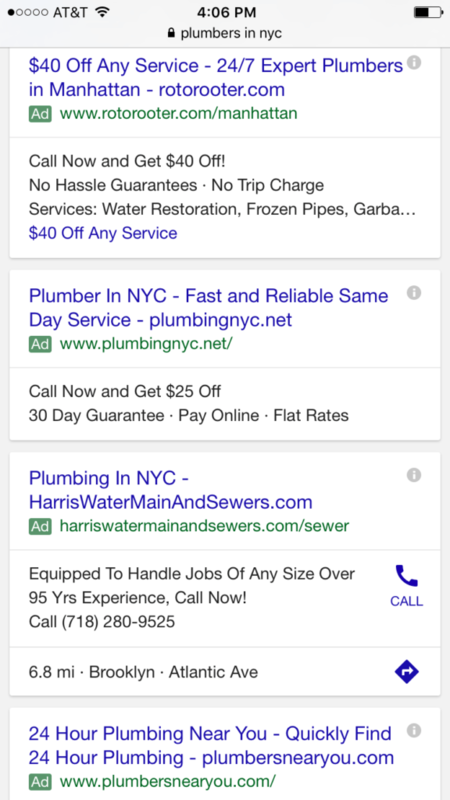 When you type a search into Google, you have probably noticed that the results at the top and bottom of the SERP are noted as ads. This section is known as Google AdWords or pay-per-click online advertising. 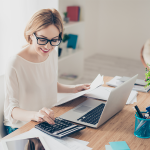 As a small business owner, you can have your ad appear in this section by creating an account on google, writing your ad, and setting your price. Google then determines which ads to rank based on the quality and relevance of the ad and how much you bid against others on certain keywords. If you own a pizza restaurant some keywords you might bid on are “pizza” “italian restaurant” and “cheap food.” When someone searches for these terms, your ad has a chance to show. We will go into more detail about how Google determines ad rank below. Bonus: What’s better than Google Advertising? Getting traffic from Google for free. Get our guide and learn how to rank on the first page! 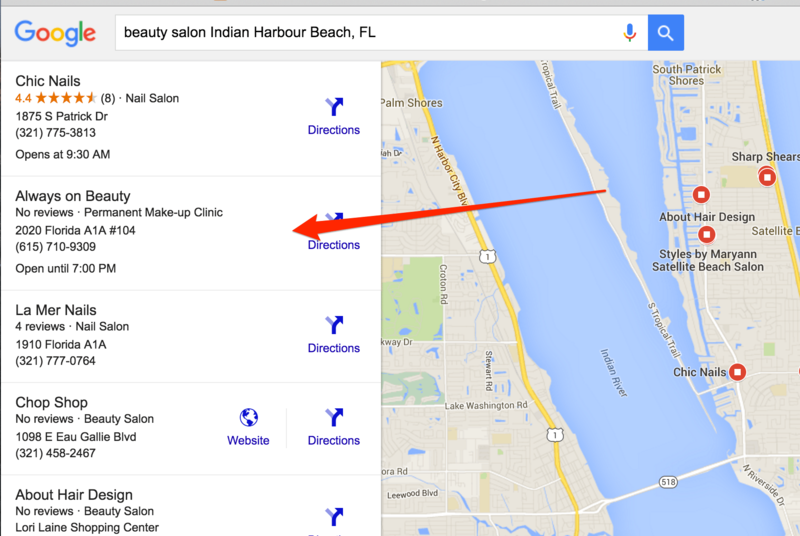 This section of Google is extremely important to local businesses as it uses the location of the person searching to show businesses that are closest to them. For example, if a consumer searches for “pizza near me,” the local results section will show three pizza restaurants near the person searching, along with the restaurant’s rating, address, and hours of operation. We will have more information on how this section works later in the article. The organic results are the websites that Google believes are most interesting and relevant to the user based on their search. Google uses a complex algorithm to determine which sites to list on the first page of the search. You will notice that sites in this section are usually very well known websites such as Yelp, Angie’s List, and Facebook. 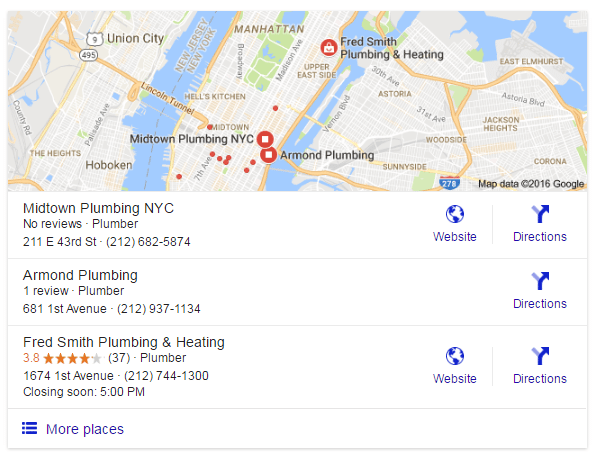 If your business is in a competitive market, it can be difficult to appear on the first page of the search results, but we will explore some ways to get your business listed in organic results. If you are only thinking about Google on desktop, then you are failing to recognize more than half of your potential customers. Mobile has surpassed desktop as the main device people use to search Google. There is less space on a mobile device so you need to make sure your message is straight to the point. People on their phones are more likely to visit a business the same day, so you want to tailor your message depending on if it’s for desktop or mobile. We will get more specific on how each section of Google varies between desktop and mobile and what that means for your business below. Google decides which ads to run based on which ads they think will get the most clicks. Since the ads are pay-per-click, Google wants to make sure it is only showing ads for a search that have a high chance of getting clicked on. Google’s billion dollar market value comes mostly from advertising revenue, so it is clear that Google ads work and are driving traffic to websites that use Google Advertising. Whether you want your ads to show on mobile, desktop, or both. The bid is the price that you are willing to pay for a click when your ad shows for a specific keyword or keywords. You can set your bid as high or low as you want, but you are competing against others that are bidding on the same keyword. The cost of the click is going to depend how much other companies bidding on the same term are willing to pay. If you are a realtor in a small town you might be able to bid less than $1 per click on a keyword and still have your ad show in this section. However, if you own a medical malpractice law firm in a big city, the cost per click will be much more expensive. This has to do with how relevant your ad is to the search that is made. If someone is searching for a personal injury lawyer, the ad for your pizza restaurant is not going to show up, no matter how much you are willing to spend. Your ad needs to match the search that is being made. Since people usually search for the type of goods or service they want plus the location they want the product in, you will want to make sure you include product and location information in your ad. The page you link to in your ad needs to have similar keywords as the advertisement. This means that what you mention in the ad should correspond to the content on the webpage that the ad is linking to. 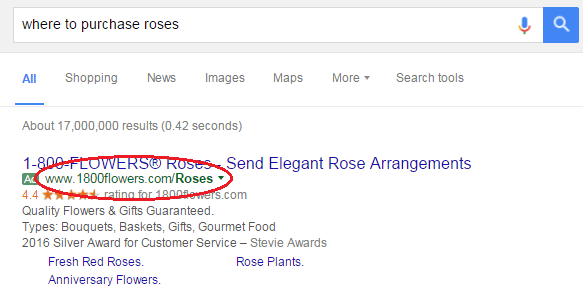 If you own a flower shop and are advertising roses, you will want the ad to link directly to the landing page where customers can purchase the roses instead of the homepage. This ad from 1-800-Flowers is a good example of relevance and positive landing page experience. The keyword “rose” appears in the ad multiple times, and the ad links directly to the landing page where you can purchase roses. The paid results section on mobile works mostly the same way as it does on desktop. Google decides which ads to show based on bid, relevance, and landing page experience. When you decide to run an ad, the default will be that your ad runs on both desktop and mobile. However, you can choose to run exclusively on mobile devices. The benefit of running ads just on mobile is that you can write the copy of your ad specifically for people using their phones. When running a mobile ad, it is a good idea to have ad extensions, which allow people to click to call and click for directions. By making it simpler for people to contact or locate your business, you can dramatically increase your conversion rates. Ad extensions do not have an additional cost, and you will only pay if someone clicks on the extension, just like with the rest of the text ad. You can enable your ad extensions by logging into your account and navigating to the “Ad extensions” tab. Want to learn more about how you can advertise your small business on Google? Read our complete guide here. 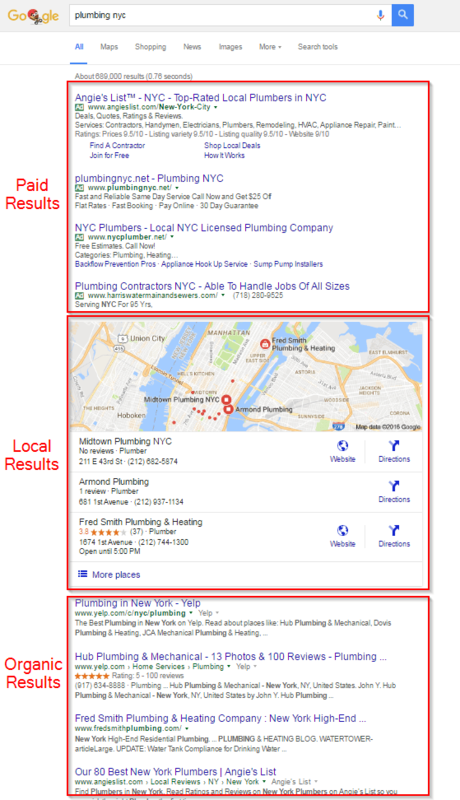 The local results on Google are typically listed right below the paid search results, and Google chooses three local businesses to display based on how far each potential search result is from the location term used in a search. If a user doesn’t specify a location in their search, Google will calculate distance based on what’s known about the user’s location. This section is extremely important for retail and brick and mortar businesses that are open to consumers, since you are mostly supported by local patrons. It is completely free to be listed, but you will need to complete a few key steps to ensure that your business shows up, and not your competitor’s. According to a recent survey conducted by the search engine experts at Moz, below are the top factors Google uses to determine which businesses show up in the local results. These factors measure the relevancy, distance, and prominence of local results. GMB helps determine relevance and is a free tool for businesses to manage their online presence across Google. Since you can list a category for your business, the products and services you offer, and a description, Google is able to match the information on GMB page against the search to determine if your website is relevant. Therefore you want make sure your information on this page is accurate and that you have verified your business. Otherwise, people could be getting inaccurate information, or your site will not show up at all. Find more information on how to set up this page here. This is pretty straightforward. Just make sure your address is listed correctly on your GMB page and across directories. Examples of directories your business should be listed correctly in are Yelp, TripAdvisor, your local chamber of commerce, and industry specific directories. For a full list of sites you can have your business listed in, go here. If your business has multiple locations, you will want to list each address so that you will have a chance to show up in the local results for multiple locations. Citations consist of your business name, address and phone number (NAP). Google uses citations to determine if a site is popular. If many different well-known sites are citing your business, then Google will know that your business is prominent. But citations are of little value unless they are consistent. Google needs to be able to accurately attribute all citations to the same business. Therefore make sure you have a standard NAP and avoid abbreviations of your business name in directories, a P.O. Box in the address, etc. Besides consistency, quality of citations is also important. Just like you wouldn’t trust a recommendation from a toddler, Google doesn’t trust (and even penalizes) citations from low quality sites. 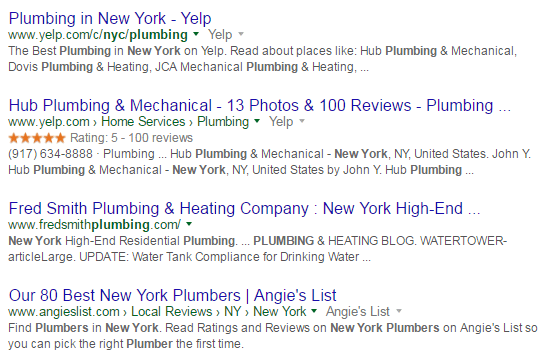 Examples of high quality citations would be from sites such as Yelp, Yellow Pages, Foursquare, and The New York Times. The local results on mobile will also have three businesses displayed, just like on desktop. 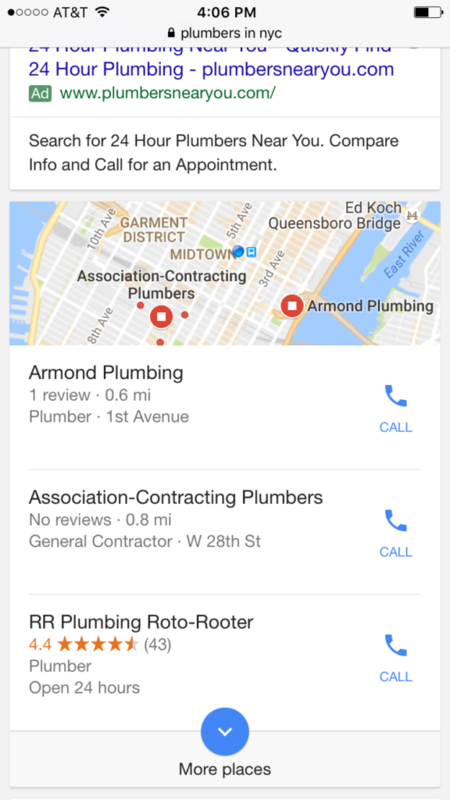 The most prominent differences are that the map is smaller so Google is showing plumbers that are closer to the location than on the desktop search, and each business displays a click to call button. This information comes from Google My Business, so make sure you have as much information as possible on this page. Google bases its organic search results on the popularity of the site and the relevance to a person’s search. Organic results are listed right below the local results. The benefit of having your business listed in the organic search results is that it’s free, and there are a lot more terms that you can potentially rank for than the local results. A website with high authority is a very high quality website that is respected by knowledgeable people in its industry (think Facebook or Yelp). To increase the authority of your website, you will need to demonstrate that people in your industry enjoy your website. The best way to do this is to have respected sites link to your website. A link from The New York Times to your site will hold more credibility than a link from your brother’s blog. To ensure your website appears for the search terms you think your customers will be using, you need to make sure you are including those keywords in your URL and within the pages of your website. We have a good resource that explains ways you can include keywords on your site. 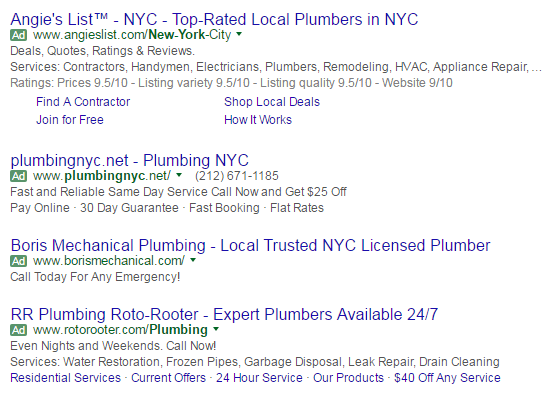 Getting listed in organic search results takes time, especially if you have a new website. The exact amount of time varies, but usually takes a few months. However, this really depends on how hard you are willing to work at it. That’s because your website has to gain internet credibility before Google acknowledges that your site is useful enough to the person searching to show up on the SERP. It is easier to be listed in the organic search results if your business is not in a competitive market. For example, if you own a jewelry business in a small town, your website is more likely to appear on the first page of this section than if you own a gym in a big city. That’s because there are not that many jewelry stores in small towns, so fewer websites will be relevant to that search. If you notice that it’s been a few months and you are still not listed in this section, don’t be discouraged. A simple way of getting listed here is to piggyback off the authority of other sites. Some popular examples of this are sites such as Yelp, Facebook and Angie’s List. Social media websites are good examples of sites with high authority that you can have your business listed on. If someone searches for your business, your social media sites should show up first in the organic results and therefore your brand will take up the most real estate on the first page. 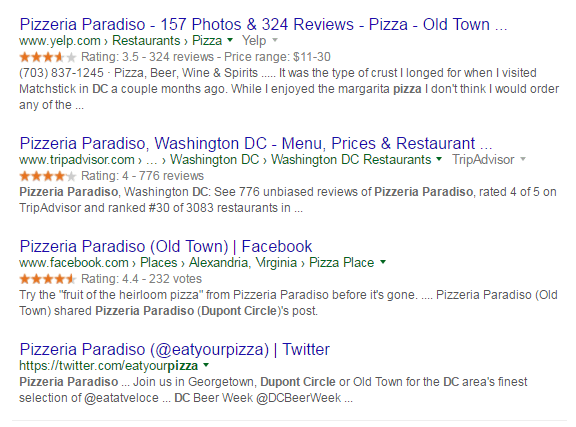 As you can see in the picture below, this local pizza place in D.C. has four listings on the first page of the organic search results just through different social media sites. People are much more likely to visit a restaurant that not only has reviews, but that has good reviews. 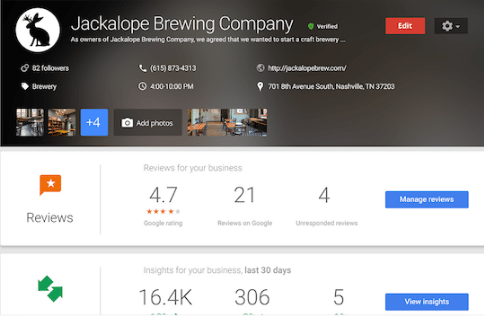 When you’re social media pages are listed, so are the reviews that you have on pages such as Yelp, Google, and Facebook. Make sure you are responding to your customer reviews, and ask people to leave reviews on your site. Online reviews are critical to a small business, so don’t be afraid to ask loyal customers to write reviews for you. If you are worried about getting negative reviews, keep in mind that if you respond to these reviews constructively, they won’t necessarily harm your reputation. We have a good article about how to respond to negative reviews that you can find here. Organic results on mobile are very similar to how they appear on the desktop. The only difference is the amount of space given to each site on mobile. Make sure that your website is mobile friendly. 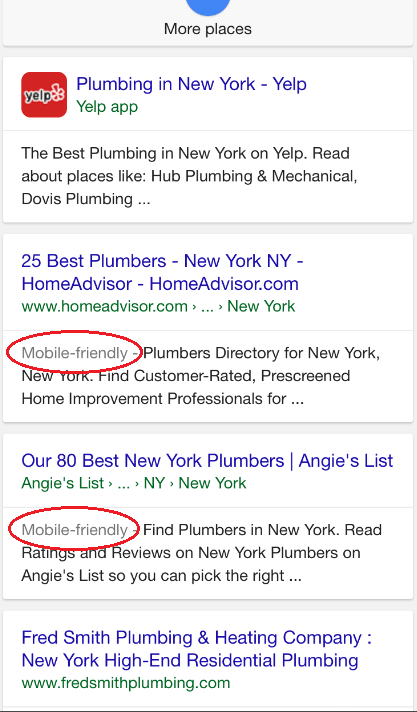 If it’s not, you will notice that you may rank in organic results on a desktop but not on a mobile device. We have a section about optimizing your website for mobile in our article about mobile marketing. Ranking on Google’s search engine results page (SERP) is important for driving traffic to your small business website and gaining new customers. Now that you know how Google search works, focus on getting listed in the local results section, but if you notice that you’re not ranking in the top three, then consider using Google AdWords to make sure your website shows on the first page of the search results. 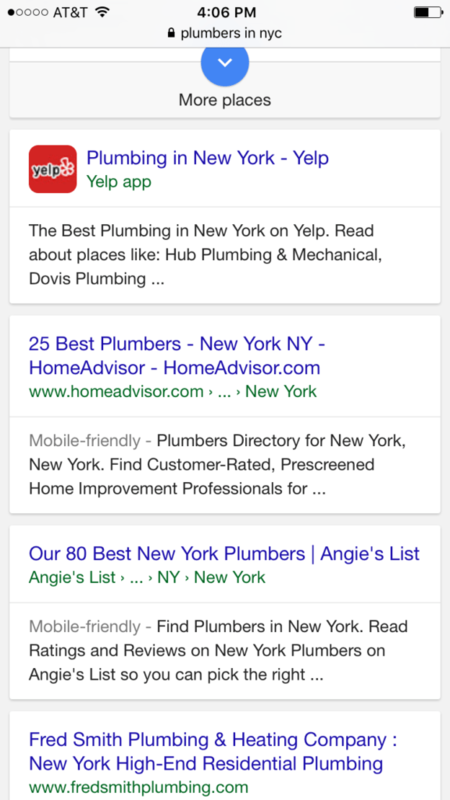 To rank in the organic results, your best bet is to get your business listed on third party sites that have better ranking authority, such as Yelp and TripAdvisor. If you have any additional Google related questions, leave a comment below. Don't forget to check out our free guide on how to get a website up and running in less than an hour. Maggie Aland is a staff writer for Fit Small Business and editor of the Marketing and Reviews sections. She writes on a variety of marketing topics, ranging from newspaper ads to how to market your business on Facebook. Before joining Fit Small Business, Maggie worked as a marketing associate at a niche publishing company. There she was responsible for determining the marketing plan and keeping up with the budget of 10+ B2B products. Her experience includes email, direct mail, social media, events, and more. When not editing or writing, you can find Maggie looking for the best brunch spots in NYC. Does SERP matters with the site’s age and the date of posting an article? Hi Krish. Domain age shouldn’t have that big of an impact. Although older domains have more time to build domain authority. As far as posting dates, if you have older articles that aren’t ranking that well, I recommend making some updates and updating the publishing date. This is beneficial in two ways: readers will be happy to see that your content is recent and up-to-date and Google will rank you higher because it will recognize your content is fresh and recently updated. Hi! Can you give me an advice on how to do an effective Off-Page Optimization? What I’m doing right now is purely blog commenting, social bookmarking and article submission. Are these still effective nowadays? One way to increase your website’s ranking on the search engine results page is to get citations (name, address and phone number of your business) on many different sites. One easy way to do this is to make sure your business is listed in online directories such as Yelp, Angie’s List, and your local chamber of commerce. For more information on ways to optimize your website for SEO purposes, view our guide on increasing google page rank. Hey there ,I’m a small business never advertised at all before always by word of mouth . What do you suggest i start with ? I’ve read your website and all your questions and comments. Keep in mind i have little to no experience in advertising . There are lots of options. One pretty simple first step would be to get a small business website. With Weebly, you can create one for free to start with, just to get something up to represent your business. Another good initial step, is to just be involved as a business in the local community. Sponsor a local marathon or be at some event and rep your business. It will get you local awareness and help you start building your customer base. Thanks for the question! The easiest way to get a website is to use Weebly. We actually have a guide that walks you through building a Weebly website step-by-step. Check that out by clicking here. i Have signed up for the business account on google, Mybusiness. I got it verified and set up my page but I am still not seeing it on google search for local salons. What am I no doing right?